Reconciled to God — But How? “From Text to Life: Living in the New Creation” is the Lectio summer series’ focus, followed by Genesis in the fall. All Lectio readings, including the Book of Revelation, are archived at spu.edu/lectio. 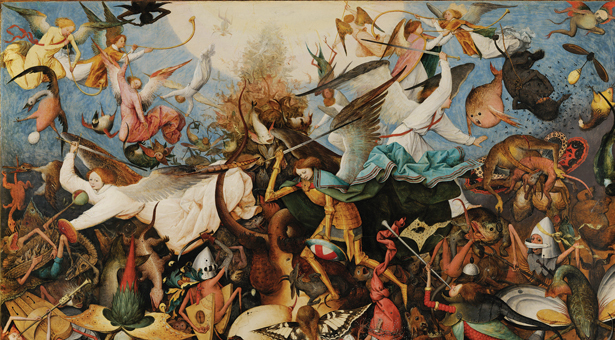 Pieter Brueghel the Elder, “The Fall of the Rebel Angels” (a depiction of Revelation 12:3–9). Oil on oak, 63" × 46", 1562. Royal Museum of Fine Arts, Belgium. The Book of Revelation is the strangest book in the Bible and its most controversial. For almost 2,000 years, Christians have found its bizarre snapshots of peculiar beasts in strange places both disturbing and captivating. The great reformer Martin Luther accepted Revelation as canonical but did not use it in his preaching or teaching ministry because he considered it much too difficult for rank-and-file Christians to understand. Similarly, Revelation is the only New Testament book for which John Calvin did not write a commentary. Even John Wesley simply parroted the work of another, Johann Albrecht Bengel, when taking notes on Revelation for his popular Explanatory Notes Upon the New Testament, and then rarely mentioned the book in his sermons. Many Christians are deeply suspicious of this book because of how others have used it to promote movements of end-time fanaticism and fearmongering. This is the real tragedy of Revelation: that a book of such poetic power and theological insight has been handled with either heavy hands or kid gloves, with either fanatical attentiveness or fearful neglect. Revelation’s first word is apocalypsis (“revelation”). In the Bible this word identifies a type of literature and theological perspective: an apocalyptic writing that must be read as such. In fact, the history of the book’s misinterpretation is narrated by the failure of its teachers to read this book for what it actually is: an apocalypse. To read Revelation as a literal prediction of future events or as a cryptogram ciphered by only the special wisdom of the enlightened few is to read it at cross-purposes with its literary form and theological function. The result is confusion and misunderstanding. Although apocalyptic writings, whether ancient or modern, come in various shapes and sizes, most are identified by their distinctive literary features. First, compositions like Revelation have structural integrity and are meant to be read front to back, not piecemeal. One expects repetition of important words and phrases throughout the composition, and literary patterns, such as parallelism, which connect different parts of the whole composition. Second, an apocalypse is an imaginative, evocative writing, intending to draw its readers into fresh ways of thinking about the gospel’s truth by using symbols and poetic verse. Numbers, for example, are important signals of truth that lend precision and order to Revelation’s otherworldly visions. Finally, the cosmic light and sound effects of Revelation are what happen when God shows up. “Apocalypse” is shorthand for salvation — salvation from the powers of evil that sap life from God’s creation. Such a salvation is God’s salvation alone, because we can’t save ourselves from the evil powers that oppress and impoverish our humanity. Not only is Revelation from or of Jesus Christ (1:1); it is also about Jesus Christ, whom John calls “the word of God.” All that John sees and writes down is a “testimony” (Revelation 1:2) of who Jesus is, even as the incarnate one witnesses to who God is. This is no esoteric or obscure writing; Revelation’s message is the same as the rest of Scripture’s witness to God. This is a revelatory word, faithfully written down by the prophet, that testifies to God’s victory over evil and death because of Jesus. Read it as such!